Apparently there is a restaurant called The Vanderbilt in Brooklyn, NY that specializes in various appetizers, including fried brussels sprouts. We say “apparently” because we haven’t been there (yet! ), so we don’t feel qualified to offer a personal opinion as to their specialties. But, when researching brussels sprouts recipes (this one is our usual go-to, but we get bored with it), we found an entry on the Food 52 recipe/cooking website from a woman who loves the “undisputed star” brussels sprouts appetizer from The Vanderbilt so much that she recreated the recipe at home. (After a quick perusal of The Vanderbilt’s menu, it doesn’t look like they currently offer the sprouts; all the more reason to try the homemade version.) Peeling the brussels sprouts is rather time-consuming (if you have kids — put them to work!) but worthwhile to get a nice mix of crispy individual leaves and tender cores. We think it’s the sauce that really makes this an outstanding side dish: spicy sriracha combined with sweet honey, sour lime juice and just a touch of savory sesame oil. Frying the sprout leaves can be a bit tricky (they pop and splatter a lot) and of course isn’t the most healthy way to get your veggies, so we tried roasting them in the oven instead. Although the roasted ones weren’t quite as crispy, they were still really good, and we could eat just about anything tossed in that flavorful sauce. Cut off the flat end of each sprout and peel off the leaves until you get to the heart (when it becomes difficult to peel off any more leaves.) You may have to cut the flat end a couple of times to keep peeling off individual leaves until you get to the core. Whisk together the sauce ingredients in a small bowl. 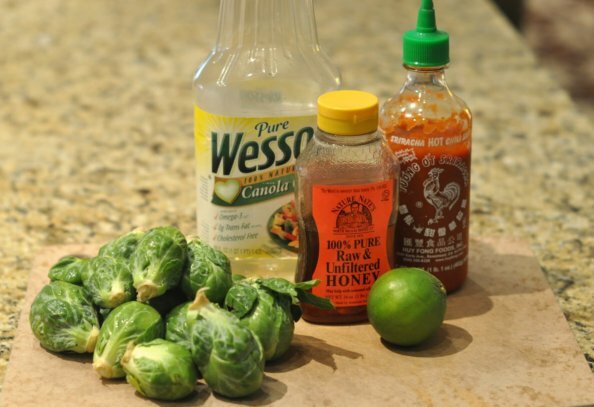 The original recipe calls for 1 tablespoon sriracha, 3 tablespoons honey and the juice of 1 large lime (for 1 pound of brussels sprouts.) We decreased the amount of honey to 2 1/2 tablespoons and added a teaspoon of sesame oil. Toss the leaves with olive oil and salt, then spread them out in a single layer on a cookie sheet. Roast the brussels sprouts in the oven preheated to 400 degrees, tossing once halfway through the cooking time, until the leaves are browned and crispy and the cores are tender — about 15-20 minutes. If you are frying the brussels sprouts, the original recipe calls for heating about 2 inches worth of oil in a large pot over medium heat until hot enough that an individual leaf will sizzle and crisp as soon as you put it in the oil. Make sure your pot is deep enough — ours wasn’t and the oil splattered a lot. Fry the sprouts in batches, being careful not to overcrowd the pot. It should take just a couple of minutes per batch to get them crispy. Whether frying or roasting, drain the crispy sprouts on paper towels when they are done. Sprinkle the fried sprout leaves with salt. If you roasted the leaves, taste them and add a little more salt if needed. Place the brussels sprouts in a large bowl, slowly add the sauce and toss until the sprouts are coated. Serve immediately — the leaves may get a bit soggy if they sit very long after you add the sauce. But these sprouts are so addictingly delicious that they aren’t likely to be sitting around for long!